It has been 10 years since a camera trap’s photo gave last evidence of a wild tiger in Cambodia’s Eastern Plains Landscape. Leading scientists confirmed that there is no viable tiger population left in Cambodia. The announcement came subsequent to a recent legal designation of increased new protected areas and wildlife corridor connectivity under the Ministry of Environment, leading to a total of 7.43 million hectares — almost half of the country’s land — that are legally protected. 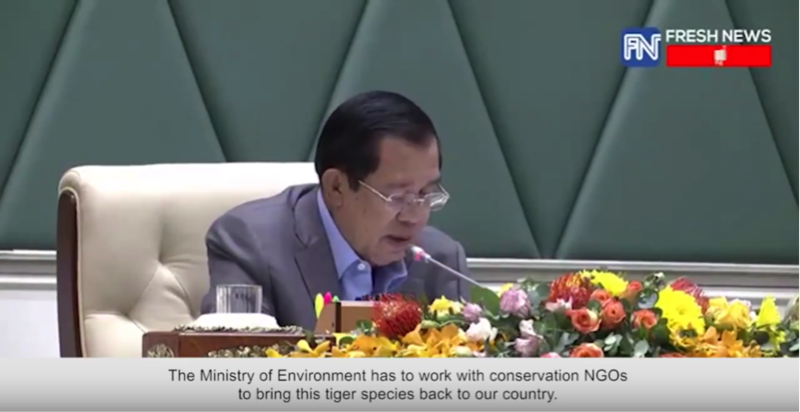 “We are deeply encouraged by the full support of the Samdech Techo Hun Sen for his endorsement of this ambitious plan to bring tigers back to the Eastern Plains Landscape of Cambodia. This is the first and foremost important step to have high political commitment for such project. However, more work needs to be done to realize this plan including securing a large enough area as an inviolate site, increasing boots and effective law enforcement on the ground, improving prey density, and securing the safety for local people” said Mr. Seng Teak, Country Director of WWF-Cambodia. As one of 13 tiger-range countries, Cambodia plays an important role in TX2 - the global goal to double wild tiger numbers by the year 2022, committed by 13 governments at the St Petersburg Tiger Summit in 2010. TX2 (‘T times two’) is one of the most innovative and ambitious conservation goals ever set that has managed to halt the sharp decline in wild tiger numbers for the first time in conservation history. The Eastern Plains Landscape, which covers most of northeastern Cambodia, acts as an important habitat for many other endangered species, including the Asian elephant, leopard, dhole, banteng and giant ibis. Protecting these species and restoring tigers in the landscape will offer huge economic potentials for local inhabitants, as the Eastern Plains Landscape may become a popular ecotourism destination.